Everybody loves Minis - from the spectacular police chase in the famous Italian Job movie right up to the incredible Mr Bean ! 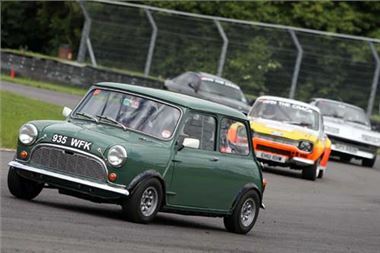 And the world's most popular car takes over the Castle Combe Race Circuit, near Chippenham, on Saturday September 24th, for the MiniWorld Action Day, to celebrate the Mini Cooper's 50th Birthday - a fun action-packed day out for the whole family. The popular event at the Wiltshire circuit includes track sessions where owners can drive their Minis on-track, a Mini cruise, 100 club displays featuring a stunning collection of up to 1500 Minis, of all shapes and sizes, together with 50 trade stands featuring all the leading Mini parts suppliers. There will also be several out of this world special guests, some from a galaxy far, far away, including Daleks and Storm Troopers who will be transported to the circuit via the Tardis to collect for charity. Please give generously or you will be exterminated! Keep an eye out for the two special Cooper displays to celebrate 50 years of the performance pocket rocket Mini - we'll have a selection of 50 original classic Coopers and 50 new BMW MINI Coopers. If drooling over the cars on display and watching them on the track leaves you hungry for more then drivers from the Mighty Mini Championship, including the 2010 Champion - Louise Inch, will be offering high-speed passenger rides around the circuit in their race cars - it's £20 a session, with the money raised donated to charity. Louise will also be leading a woman-only track session at 1.15 pm to show the men how to drive. Also new for this year's show, will be several displays of drifting cars, guaranteed to bring tears to your eyes as they smoke their tyres around the circuit. For those not familiar with this crazy and spectacular sport, Drifting refers to a driving technique where the driver intentionally over steers, causing loss of traction in the rear wheels through turns, while maintaining vehicle control and a high exit speed. It's noisy and a real masterclass in car control - don't miss it. Tickets for the show are £10 on the day / £5 for OAPs or only £8 / £4 in advance. Under 16s are FREE. Join and check out the MiniWorld Action Day page on Facebook for all the latest information. For more information, log on to the circuit's web site www.castlecombecircuit.co.uk.